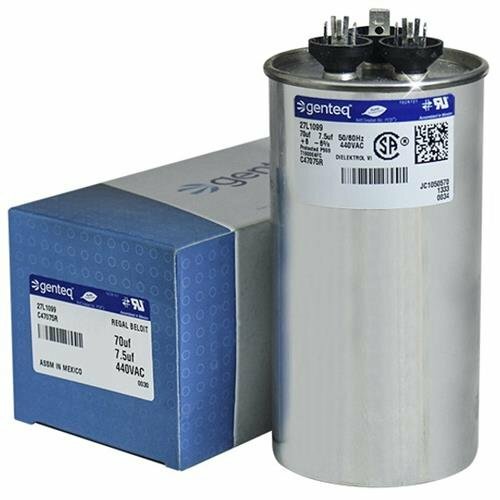 Genteq ( formerly GE Industrial ) is our most popular line of capacitors, and the choice of most OEMs. Genteq creates innovative, premium comfort and electrical components; their proven reputation for high quality, highly reliable products make this the preferred capacitor brand. Genteq Motor Run Capacitors replace / supersede old obsolete GE Industrial capacitors and are considered the most reliable capacitor available. Genteq is the choice of Most Major Manufacturers. Take Note: Many dimensions have changed due to engineering and changes in manufacturing...if your dimensions are critical , be sure and contact us for current dimensions. All dimensions subject to change without notice. Buy with Confidence from Airstar Supply your Premier Authorized Genteq Distributor!! If you have any questions about this product by Genteq, contact us by completing and submitting the form below. If you are looking for a specif part number, please include it with your message.